A graveside service of Christian burial for Annie Elizabeth Eznack Reed, 90, Thursday, April 4 at Memory Lawn Cemetery at 11 a.m. Friends and family are invited to attend the graveside service and afterward at a funeral repast at the Bostick Room at the First Baptist Church on Second Street. Mrs. Reed died Tuesday, April 2, 2019, at her home surrounded by her family. She was preceded in death by her beloved husband of 41 years, Hoyt Jackson Reed; and her parents, Mary Catherine Slatten and Almond Benjamin Eznack. She is survived by her daughters, Dr. Cathleen Reed Seymour and husband Dr. Dan Seymour and Jacqueline Reed Horton and husband James Hershel Horton, all of Natchitoches; her beloved grandchildren, Carrie Seymour LeBlanc and husband John Harold LeBlanc of Shreveport, James Reed Seymour and wife Laura Hetherwick Seymour of Baton Rouge and Mary Catherine Ackel of Bossier City; and finally, the light of her life, her great-granddaughters, Stafford Rose and Annie Reed Seymour of Baton Rouge. A graduate of Boyce High School, she continued her education at Northwestern State College, graduating in 1949. She earned a Master’s and a Master’s Plus 30 hours in Home Economics Education. She was a consummate educator for more than 40 years, teaching Home Economics, Science and Social Studies at the secondary level. She began her teaching career at Pleasant Hill High School, later moving to Ajax High School and then to Marthaville High School when her husband became principal there. After moving to Baton Rouge, she taught at Glen Oaks High School. Upon the family’s return to Natchitoches, she again taught at Marthaville, Allen and completed her secondary career at Natchitoches Central High School. After the death of her husband in 1990, she taught Culinary Arts to inmates at the Winn Correctional Institute and Early Childhood Education at the Louisiana Technical College. 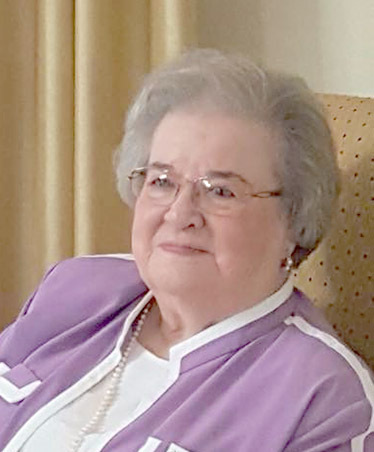 She was a member of the First Baptist Church of Natchitoches for more than 50 years where she and her husband, along with others, began the Couples, Too Sunday School Class. She was honored as a Golden Girl of PEO, indicating membership of 50 years, and was a current member of Chapter BK. She was also a 50-year member of the Order of the Eastern Star and a lifetime member of Sigma Sigma Sigma social sorority. She was a wonderful wife, mother and grandmother, and was known as a consummate biscuit maker. She enjoyed cooking, sewing and traveling, especially with her family. She is well remembered by many former students with whom she remained in touch for many years. Many former students can cook and sew as a result of her efforts. Honorary pallbearers named are Dr. Steven G. Horton, Randall Hennigan, Jimmy D. Barnhill, Paul E. Smith, O. Edwin Dunahoe, Kennan K. Kelly, Michael Frankell and Dr. Bennie G. Barron. Services will be conducted by the Rev. Thomas Rush of First Baptist Church of Natchitoches, Mother Suzanne Wolfenbarger of Trinity Episcopal Church and the Rev. Louis Sklar of the Catholic Diocese of Alexandria. The family would like to thank her caregivers that were so loving and caring during the last two weeks of her life; Brenda Robinson, Debra Jones, Cheryl Dixon, Nyla Gardner and Essie Triggs; and a special note of gratitude to her caregiver for the last two years, Jennifer Talmadge. In lieu of flowers, the family requests donations to the NSU Foundation, c/o Annie and Hoyt Reed Scholarship at Northwestern State University, 5355 University Boulevard, Natchitoches, LA 71497.